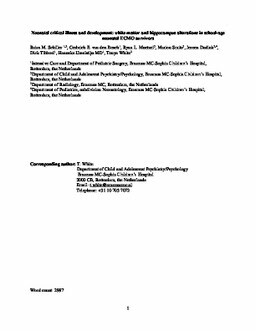 Aim: Examine the neurobiology of long-term neuropsychological deficits following neonatal extracorporeal membrane oxygenation (ECMO). Method: This cross-sectional study assessed white matter integrity and hippocampal volume of ECMO survivors (8-15yrs) and healthy controls (8-17yrs) using Diffusion Tensor Imaging and structural MRI, respectively. Neuropsychological outcome was evaluated in patients. Included clinical predictors of white matter integrity: age start ECMO, ECMO duration, highest oxygenation index before ECMO, highest mean airway pressure and mechanical ventilation duration. Results: Patients (n=23) had lower global fractional anisotropy than controls (n=54)(patients=.368; controls=.381; p=.02), but similar global mean diffusivity (p=.41). Patients had lower fractional anisotropy in the left cingulum bundle (patients=.345; controls=.399; p<.001) and higher mean diffusivity in a region of the left parahippocampal cingulum (patients=.916; controls=.871; p<.001). Higher global mean diffusivity predicted worse verbal memory in patients (n=17)(β=-.74, p=.01). Patients (n=23) had smaller bilateral hippocampal volume than controls (n=43)(left: p< .001; right: p< .001). In patients, this was related to worse verbal memory (left: β=.65, p=.02; right: β=.71, p=.01). Interpretation: Neonatal ECMO survivors are at risk for long-term brain alterations, which may partly explain long-term neuropsychological impairments. Neuroimaging may contribute to better risk stratification of long-term impairments.